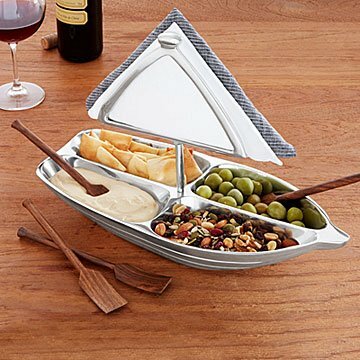 Guests will love snacking on dockside delights from this aluminum sailboat server. The four sections inside the hull hold nuts, candy, relishes, olives, or whatever floats your boat at your next dinner party. Creative cargo includes paddle-like spoons made from sheesham wood and a built-in napkin holder in the mast. Made in India. Hand wash with mild soap and water. Help condition and preserve your oars with mineral oil. We used this Twice during the holidays once for veggie holder and then the next morning for all the fixings for. Perfect Bloody Marry Bar. I haven't used it as it was a gift. You'll be delighted when this ship comes in. Just one dish to carry to the flybridge or the patio that can hold a generous amount of a variety of appetizers. This is perfect for the get-togethers with other sailing enthusiasts. Perfect for serving Hors D' Oeuvres especially at a Lake House Party. Perfect for my needs and for gift giving! I haven't used it yet as I am saving it for my new house. Great for entertaining with friends in a home on the shore with boats going by all the time. Great product but was delivered broken. Poor quality.